What does “Occupy Boston” think the government should do when it comes to spending issues? The Great Recession has revived the debate over Keynesian effect on Aggregate Demand. The debate is being tackled by three fronts: the effectiveness of fiscal policy; the number of dollars for the stimulus package; and where and how the government should spend the stimulus. However, there is a relative gap in knowing how the citizen grasps the current recession and how it affects the overall performance of the economy. As a political and policy matter, citizen expectations determine not only the required confidence for investing in the private sector but also the future political outcomes. This paper depicts the role that the government should pursue in the economic recovery from the perspective of the so-called “Occupy Boston Movement.” Moreover, also, how the government should spend to affect the business cycle. By contrasting two perspectives on federal spending –Friedman, and Keynes-, the first part of the paper is a brief review of the debate over the role of government during the economic crisis. The second section shows statistical results from forty interviews with members of Occupy Boston Movement. Finally, the third section concludes and makes policy recommendations. Based upon two general theories of government spending –Friedman and Keynes- we identified 24 federal agencies, departments and commissions that perform at least one of the three main fiscal policy functions of the federal State: Allocation of resources; Redistribution of resources; and Stabilization of the Economy. Considering those 24 federal institutions, interviewees were given information about the share those institutions have in the fiscal year of 2011. We interviewed thirty-five members of the movement “Occupy Boston,” regardless age, ethnicity or birthplace. They were just asked whether or not they were camping at Dewey Square. Then, they were informed about the budget regarding percentage, contracts, and grants. Interviewees were asked: “if you would be asked to re-allocate the budget, how would you allocate the resources?” The interviews were conducted at Dewey Square in Downtown Boston Massachusetts, between October 17th and October 21st. The format of the survey was mostly one of an interview due to the complexity of the issue. Most of the members approached by the interviewers did not know what agencies exactly do. Therefore, the interviewer should explain in detail some of the agencies’ missions. Also, explanations were due when it came to budgetary issues such as the difference between grants and contracts. Finally, budgetary information for the fiscal year of 2011 was taken from www.usaspending.gov. Since 2008 Paul Krugman is advocating for a stimulus plan that should be at least $600 billion (New York Times Nov. 10, 2008). This 2008-Nobel-prize-awarded economist strongly supports the Keynesian perspective about the effect that fiscal policy has on the economic recovery. What it means is that the Aggregate Demand can be affected by either government spending or tax cuts. As a Keynesian, he thinks fiscal policy should be used as a tool for stabilizing the economy, which also means having a countercyclical fiscal policy. Therefore, the government must spend during economic crisis while saving during economic booms. However, as Rivlin has reminded us, doing so is not that easy, especially when it comes to policy proposals. Make policies work implies a “battle over the federal budget” (Rivlin 2002). However, Krugman has not been along in advocating for more expending measures. Indeed, there has been a boom of academic articles that try to assess and to measure that proposition. Fernandez-Arias and Montiel (2011) have shown how most of the Latin American countries reacted the Great Recession by applying fiscal expansion. Likewise, “countercyclical spending measures were concentrated on infrastructure investments, programs to support small and medium-sized enterprises weakened by the crisis, and social safety net programs” (Fernandez-Arias, E., & Montiel, P. page. 320 2011). Researches about economies overseas have recently shown also that government may affect private consumption and also generate confidence. Wang and Gao (2011) demonstrated that considering the specific labor and commodity markets in China, “during 1981-1983 and 19998-2008, government consumption and taxes had a significant Keynesian effect on private consumption” (Wang, L., & Gao, W. Page 74. 2011). Nonetheless, spending is not only aimed at recovery concerns, but also at the so-called social balance. Theoretically speaking, spending is intended to assuage the externalities generated by the market. Therefore, following Galbraith, “every increase in the consumption of private goods will normally mean some facilitating or protective step by the state” (Galbraith, 1958 page 189). This sort of spending stems from a perspective of social policy. Galbraith’s concept of Social Balance tries to justify public spending as a mean to ameliorate undesired economic spillovers. Somehow, if economic growth brings undesired outcomes or externalities, it means someone-somewhere is getting affected negatively by that economic growth. From those economic effects, entitlements flourish establishing a basic right to survival. Regarding Arthur Okun, “the assurance of dignity for every member of the society requires a right to a decent existence”(Okun, 1975. page 17), and it includes essential services such as healthcare, housing and the like. The opposite face of the Keynesian perspective is the Neo-Classical approach. Moreover, it also has been present in the debate. Led by Milton Friedman, the neo-classical proposition argues that the market has the stabilization power that Keynesians look for in government spending and tax cuts. From that perspective, the Government must be limited to five functions: public safety and protection, law enforcement, democratic procedures, security and the promotion of competitive markets. “In summary, the organization of economic activity through voluntary exchange presumes that we have provided, through government, for the maintenance of law and order to prevent coercion of one individual by another, the enforcement of contracts voluntary entered into, the definition of the property rights, the interpretation and enforcement of such right, and the provision of monetary framework” (Friedman, 1962. page 27). Furthermore, one of the most compelling arguments surrounding the failure of countercyclical fiscal policy rests on a lack of data and appropriate methods for measuring the effects of government spending on Aggregate Demand. As Parker recently concluded “we do not have a good measure of the effects of fiscal policy in a recession because the methods that we use to estimate the effects of fiscal policy” Parker, J. A. (2011). In other words, we lack historical examples of deep recessions; therefore non-linearites are hard to measure. Nonetheless, there have been studies that go even further and have bolstered the neoclassical point of view. Taylor stated that by doing an empirical examination of the three countercyclical incentives, none of them had a positive effect on consumption (Taylor, J. B. 2011). Even though the critics point out lack of empirical information, as a political issue, spending may consider public opinion. In the last two years, the United States has seen grow two “social movement” that argue on the role the federal government must pursue. The so-called Tea Party and the so-called “Occupy Movement” apparently have their preferences on government spending and government role. “Occupy Boston” is the social manifestation we surveyed in this paper. The following section depicts the empirical data we took from the interviews. As we mentioned above, interviewees were asked whether or not they were camping in Dewey Square. After having that confirmation, they were asked to assign a budgetary value to each of 24 agencies and departments of the federal government. Generally speaking, as it is shown in graph 1 and 2, it is not possible to conclude that the movement has a unified concept on how the federal government should allocate the Budget. Outcomes show that only a 42% thinks that the government should spend more money, while a 28% considers it should spend less. Spending more does not constitute an overwhelming majority in the Movement. A high 30% that suggested spending the same mostly meant either a lack of knowledge about the budgetary issues or reluctance to answer. Considering the categorization of the three main fiscal policy functions of the federal State: Allocation of resources; Redistribution of resources; and Stabilization of the Economy, we found that Redistribution function of the state is what the majority is demanding. Graph #3 shows that 74% of the interviewees prefer redistribution agencies to spend. Those agencies are the Department of education; the Department of Health and Human Services; the Department of Housing and Urban Development; and the Social security administration. On the other hand, we find that Allocation Agencies and Departments are in the second position regarding spending. 46% against a 26% prefer those agencies to spend more than less. Those agencies are: Department of Agriculture, Department of Defense, Department of Energy, Department of Homeland security, Department of Justice, Department of state, Department of Interior, Department of Transportation, Department of veteran affairs, Environmental protection agency, General service administration, National Aeronautics and Space Administration, National Science Foundation, Nuclear regulatory commission, Office of personnel management, Small business administration, United States for International Development. Agencies represented in graph #4. Finally, among our categorization the less popular function is stabilization. Departments which mission are related to stabilization objectives are seen and understood merely bureaucracy. Only a 20% agrees (as shown in Graph # 5) those agencies need to have an expanded budget. Preferences start to clear once we contrast spending in Defense, Education, and Social Security. Graphs # 6 and #7 give an idea of what the priorities in spending are for the movement. The budget of the Department of Education is represented by the color blue, while the budget of the Department of Defense is in color red. On the other hand, when it comes to the Social Security administration Budget, the opinion of the interviewees is not very radical. One might expect the movement would like an increase regarding social security issues; however, outcomes are shown in Graph #7, not a dramatic contrast. Another interesting outcome that reveals strong preferences are environmental issues. Graph # 8 shows how the movement is concerned about the environment, even over emblematic state institutions such as NASA. 1. 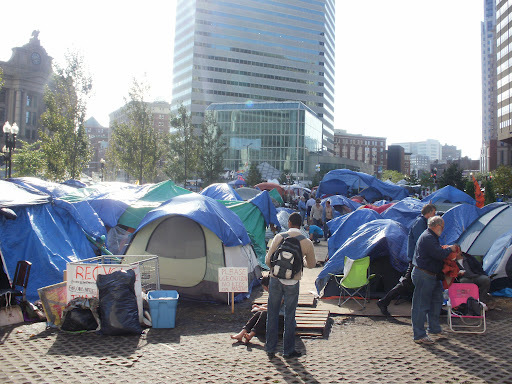 “Occupy Boston” may be characterized as a movement that prefers Spending over Austerity. It allows us to infer that considering our two perspectives on spending; they would stand on the Keynesian side. It is also clear that, following the characterization of the agencies in our three categories, the preferences are as follow: 1. Redistribution; 2. Allocation; 3. Stabilization. 2. However, the primary concern about spending among the protesters is not only the amount of money devoted by agencies but also how those agencies are investing. Further research is needed to establish the preferences in spending by agencies. Nonetheless, it is a matter of public policy itself, and it was not a concern in this survey. 3. It is imperative to point out that interviewees prefer contracts over grants. They infer from the budgets that contracts constitute a job-creating effort while grants are seen as waste money. 4. A remarkable outcome that depicts the movement is those related to Education, Defense and Social Security. When it comes to education, research and science the movement show a strong preference in investing in those fields. Otherwise when it comes to Defense. Although there is still a threat regarding terrorist activities, an overwhelming majority rejected the idea of an increase in Defense issues. Finally, there is not enough evidence that the movement would like an increase in social security spending. Fernandez-Arias, E., & Montiel, P. (2011). The Great Recession, ‘Rainy Day’ Funds, and Countercyclical Fiscal Policy in Latin America. Contemporary Economic Policy, 29(3), 304-322. Friedman, Milton. (1962). Capitalism and Freedom. Galbraith, Kenneth. (1958). The Affluent Society. Okun, Arthur (1975). Equity and Efficiency: the big tradeoff. Brookings Institute. Parker, J. A. (2011). On Measuring the Effects of Fiscal Policy in Recessions. Journal of Economic Literature, 49(3), 703-718. Retrieved from EBSCOhost. Rivlin, Alice. (2002). Challenges of Modern Capitalism. Regional review. Taylor, J. B. (2011). An Empirical Analysis of the Revival of Fiscal Activism in the 2000s. Journal of Economic Literature, 49(3), 686-702. Retrieved from EBSCOhost. Wang, L., & Gao, W. (2011). Nonlinear Effects of Fiscal Policy on Private Consumption: Evidence from China. China and World Economy, 19(2), 60-76. Retrieved from EBSCOhost. Public Management’s backbone: the Rule of Law.